Global Game Jam 2015—What Do We Do Now? Global Game Jam 2015 was an opportunity to play more with polish. We made Salvage, a very cut-down RTS in which the protagonist has to collect parts of a broken ship in order to escape from Earth before the CIA finds her. It was an opportunity to work with animation more than I had done previous, and I think it paid off: this is probably the prettiest of the games I've been involved in making. For the theme of "connected worlds", we opted for an asteroids-style game with the mechanic of using a tractor to latch onto, and orbit around, planets rather than having any steering. This worked out pretty well, and I wrote up a post-mortem on the Ludum Dare site. In April 2014, with 6 hours remaining before the cut-off time for Mini-LD 50, I discovered it was running and decided – in a fit of hubris – to make an entry in that time. 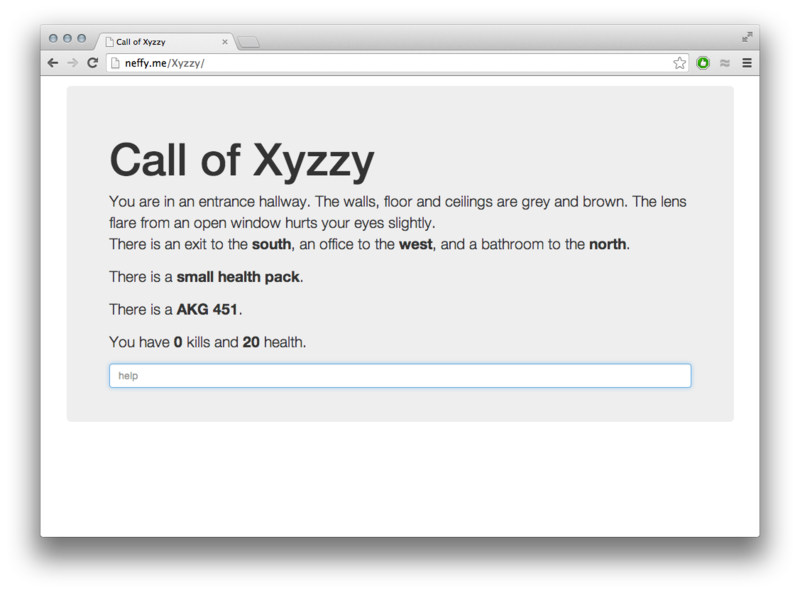 The theme was "demakes", and calling on the writing talents of my old friend Taylor Vaughan we put together a text-based adventure parody of Call of Duty in the space of 5 hours. 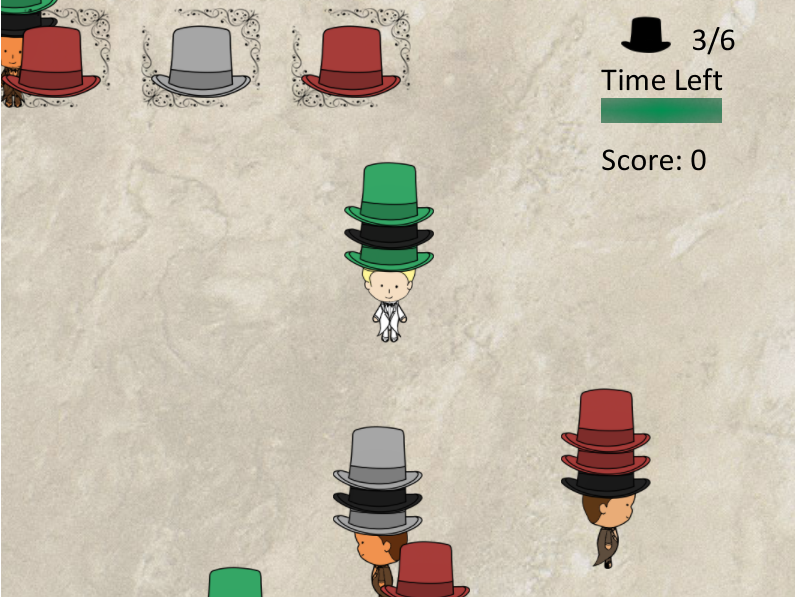 In January 2014, for the Global Game Jam (this time at City University in London) the team and I made a hat-filled game for the theme of "we don't see things as they are, we see them as we are". This was the first time I had worked with a dedicated musician on the team (the responsibility generally having fallen to me previously), which was a new and interesting experience. In December 2013, I took part in Ludum Dare 28. The theme was "minimalism" and we created a minimalist and neon-themed game which took the theme extremely literally. The game came 33rd overall, including 35th for Theme, 46th for Fun, and 54th for Audio, which I put in no small part down to the music provided by Moleman. In September 2013, we re-formed the core team once again for Ludum Dare 27. The theme was "10 seconds" and we came up with a physics puzzle game with a twist: it takes place on the face of a clock, which rotates as time ticks by. In January 2013, I took part in the Global Game Jam, at Creative England in Bristol. The theme was the sound of a heartbeat. We came up with a horror game with an interesting mechanic: at the sound of a heartbeat, a pulse travels across the screen, and you can only see anything within that pulse. Beyond that, the game was unintentionally a 2D remake of Slender: The Eight Pages. In September 2012, I completed my first game jam for Ludum Dare 24. The theme was "evolution" which we warped into a lighthearted but fast-pased game of being chased by mutant mad scientist Charles Darwin. The game came 139th overall, and 19th in the "Humour" category. Between 2005 and 2007 I was involved in Onlink: a very large mod to Introversion's game Uplink. I was brought in to work on its multiplayer aspects. Between 2005 and 2008, I started and worked on a (relatively) simple web RPG, called Xenos, in the spirit of text-based adventure games.